NEW BRITAIN — Making the city more attractive to new businesses and improving schools were issues supported by both mayoral candidates during a debate Saturday afternoon. The standing-room-only crowd at Trinity-on-Main greeted Mayor Timothy O’Brien with cheers after every question he answered, but Erin Stewart, a Board of Education member and the Republican challenger, also received a positive response as the two answered questions from moderator Debra Polan of the League of Women Voters. To open the questioning, Polan asked what regional cooperative efforts that they could share with the audience to help ease the economic efforts. Stewart, the daughter of former city New Britain mayor Tim Stewart, said working with Berlin, Plainville and Newington is essential to easing economic efforts. O’Brien agreed with the idea of partnering with these towns, but also said that the city hopes to benefit from CTfastrak — the New Britain to Hartford Busway. Another question focused on each candidates priorities as to revitalizing the city. O’Brien’s said his top priority is economic development. Stewart said she wants to fix the city’s tax rate, give the city youth a school system that they deserve, rebuild the infrastructure and create a business-friendly community. Another hot topic in the debate, was what both candidates planned on doing to change the image of the city. Stewart answered first and said she wants to inspire young people to start caring about their community. Stewart said she has demonstrated that commitment by coaching New Britain High School softball, being involved with New Britain High School marching band and organizing fundraising as well. O’Brien said New Britain is a great city already, and want’s to get others to see it that way too. At the end of the debate, both candidates said they want a bright future for the city and want it to be welcoming for business and families. Before the mayoral debate, candidates for Common Council held a forum discussing issues that ranged from bettering the city’s school system, to bringing in more businesses and families and marketing the city better. 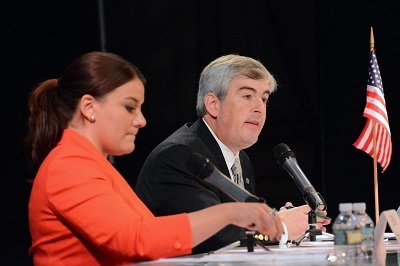 Saturday’s mayoral debate will air on Nutmeg TV at a time and date to be determined.